Parting ways with Destiny Motorsports over the weekend, Parker Price-Miller has been busy pounding the pavement to secure opportunities for the remainder of the 2018 season, and his first hurdle is cleared as he will team up with Bernie Stuebgen and Indy Race Parts and pilot the No. 71P during the 58th Capitani Classic and the 58th Annual Knoxville Nationals. 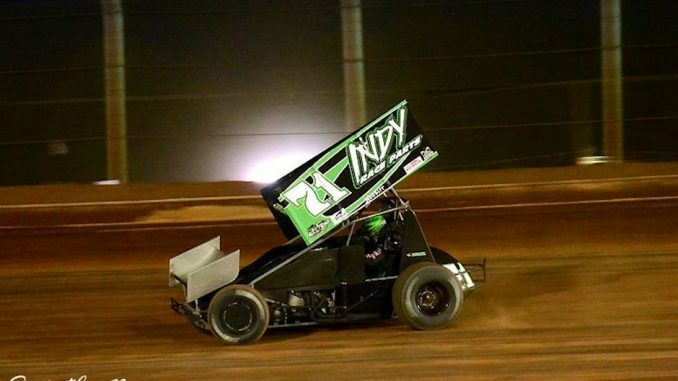 Price-Miller comes into the Knoxville Nationals sitting seventh in All Star Circuit of Champions points on the strength of 11 Top-Five finishes and 30 Top-10 finishes. In recent competition at Knoxville Raceway this past Saturday night with the series, the Kokomo, IN driver finished 15th in the feature event with 56 cars checked into the pit area. Sunday night Price-Miller will pilot the Indy Race Parts/Chalk Stix No. 71P at the Capitani Classic, and will then take his shot at qualifying for the Nationals next Thursday night. At the time of press, PPM and team are unsure of Monday night’s Front Row Challenge event. Price-Miller and his team would like to thank Townline Variety, Chalk Stix, Indy Race Parts, Bell Helmets, and PPM Titanium for their support. BY THE NUMBERS: Starts: 62, Wins: 0, Top 5’s: 11, Top-10’s: 30. ON TAP: PPM will pilot the No. 71p entry starting Sunday night at Knoxville Raceway during the Capitani Classic.